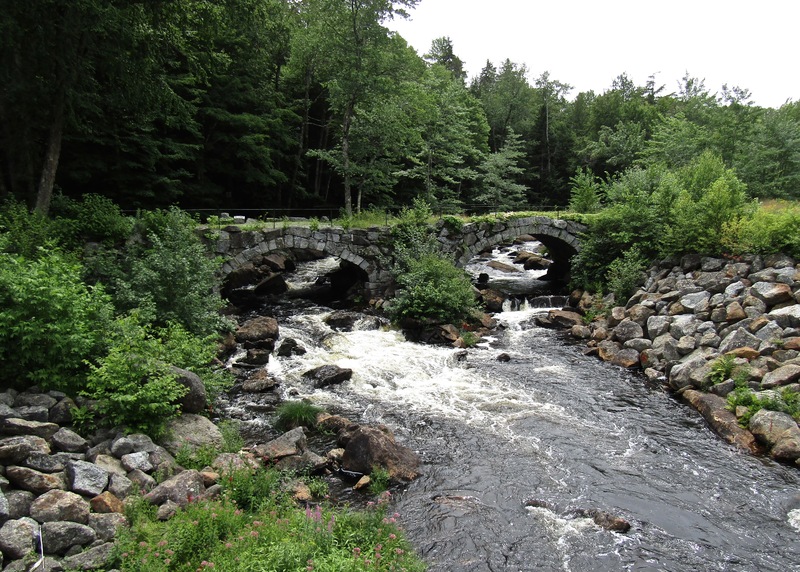 New England is known for its handsome wooden covered bridges, but did you know we also have some remaining stone bridges? Back in the first half of the 19th century, stone bridges were built by talented Scottish stone masons using native granite. They were constructed without mortar and were held up by the shaping of the stones. I don’t know about you, but I find that pretty amazing. Last week, we went to check out the Double Arch Stone Bridge* that crosses the Contoocook River off Route 9 between Hillsborough and Keene, NH. It does not allow car traffic anymore, but it is still a picturesque historic site to walk across and take in from either side. I think this is the first time I’ve ever seen beautiful red Cardinal flowers growing in water. How was the weather for traveling? Hot and humid like it has been here for several weeks. So, when it’s hot, one needs a cold one, right? 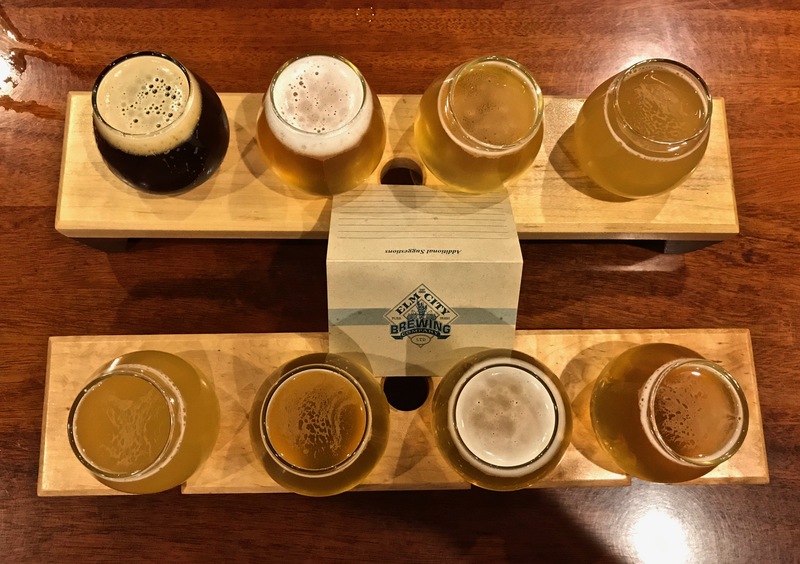 Good thing we knew right where we could find some great craft beer in Keene – Elm City Brewery. My husband liked their Dunkelweizen the best, and I was torn between the Peachy Keene and the Raspberry Wheat which were both great. We may need a cold one tonight because we’re suppose to hit 94°F with 47% humidity resulting in a ‘feels like‘ of 101°. Does that sound a little too warm for New Hampshire? Texas, Florida and Nevada are coming in around the same number. I don’t know, but I’m thinking New Hampshire is not supposed to be registering the same temperature as these southern areas. This entry was posted in New England and tagged Cardinal Flower, Craft beer, Double arch stone bridge, Elm City Brewery, Keene, Keene NH, New England, New Hampshire, Stone Bridges, Summer temperatures. Bookmark the permalink. New Hampshire isn’t supposed to feel like Texas! I’m sorry about your weather, although ours is about the same here. I’d like the Peachy Keene on principle, such a cute name. Good that you knew where to hydrate and cool off on the ride home. I watched some of the stone masons at work, when they rebuilt the banks of the industrial canal in Lowell, MA. They had to bring retired masons back to tell the younger workers how to do it. Beautiful bridge. 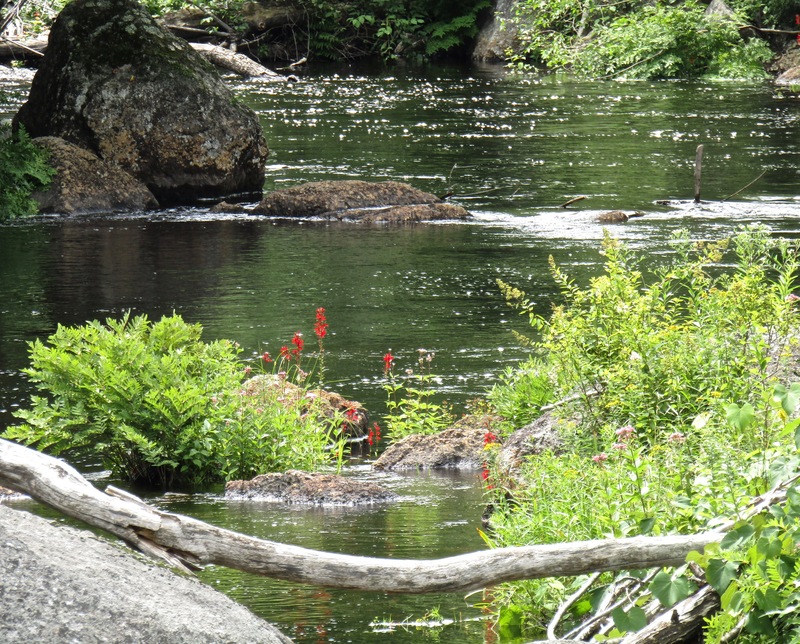 Sometimes I find cardinal flower (Lobelia cardinalis) along the river in the lowest part of the wild garden, but it never seems to be in the same place twice! Love that stone bridge! Add Georgia to that list of hot and humid days with plenty of thunderstorms. It’s normal weather for us this time of year but I never thought of New Hampshire of having the same weather as us. A drive and a brewery sound like a great way to cool off. This change is weather is really dramatic this year, and I’m guessing there won’t be any going back to what we considered ‘normal,’ and I can’t imagine what it means for all of us as we move forward. Oh, Maine is in the same humid boat as New Hampshire. Terrible! And, yes, Climate change is here. Now, lets hope the world has the grit and political courage to stop it from getting worse. On a happier note…What a fabulous bridge! My Scottish blogging buddy Tootlepedal is always featuring the most beautiful stone bridges on his blog. No surprise that the men who built that bridge were Scottish. And the occasional stone bridge. As far as I can tell, they are common in his part of Scotland. These bridges are just another thing to add to the list of amazements constructed in earlier days without benefit of modern tools. – those majestic stone Middle Ages European cathedrals too – everything a labor love! labor OF love, I meant! – and so glad someone smart is thinking of preservation and not bending to the folks who NEED to keep driving across this thing to get to where they gotta go – and in a HURRY! What a beautiful bridge. Amazing craftsmanship. So glad it’s being preserved. And don’t those Cardinal flowers look pretty!! So glad you and Dennis were able to keep yourselves from getting dehydrated!! Nice place to revisit. It is amazing how those bridges are held in place by gravity alone. As always, I have a great time in the comments. It’s so good to know that there are others who marvel at such skill as built this beautiful bridge. The cardinal flowers are a lovely bonus to the setting. And the hydration, of course, medically necessary. One cannot be too careful in this heat. Gosh, didn’t know about the stone bridges. They’re amazing. What a beautiful setting. We pretty much find 47% humidity a relief here, but you’re right. You wouldn’t expect NH to be having this type of weather. Have a cool one for me! Oh my gosh, that bridge is gorgeous! Great shot! Thanks for sharing that. 101 is too hot for me, I don’t care where! Phew! That is lovely. We have a few like that but they are quite small and are for foot traffic only. They are on really tiny roads, so I think they were never meant for anything weightier. I think those old stone bridges are amazing and a tribute to fine workmanship. I’m not quite ready to complain about this summer’s heat and humidity yet. After the winter we just had, I thought there was a distinct possibility we would never be warm again. Sooner or later though, this heat is going to get to me. I’m sure if I didn’t have AC I’d feel completely different about it. Oh, delightfully yummy all around, Judy. The bridges are gorgeous as well as amazing in their construction. Bridges to me are like airplanes in that, although my mind knows (more or less) why they work, it still seems impossible! I’m very thankful for AC, which my poor s-i-l and b-i-l, sweltering in France, don’t have as do very few people or places in Europe. Electricity is so expensive that it’s probably for the best financially, but not much fun!! I love old bridges! And I think you should always have a cold one in reserve for just such emergencies. Beautiful pictures and scary weather. It’s hot here too but not quite as hot as New Hampshire (which is crazy), and we don’t have the humidity. We’ve never had to have AC before but now we are seriously considering putting it in. Maybe I’ll just spend the money instead on cases of Peachy Keene. I agree with you about the stone bridge, amazing craftsmanship to be able to balance rocks to build a bridge strong enough to last a century! When we visited my father’s ancestral home in Ireland we went over a small stone bridge to get to the farm… oh the stories it could tell! Enjoy those craft beers, they look very inviting, and those temperatures are way too hot for comfort. Bridges are so picturesque. We saw a gorgeous covered bridge in Ontario and were smitten. As for the heat and humidity, it was the same when we were there and everywhere on the eastern side of the continent.The heat we are used to but the humidity is something else! I’d say you earned every drop of your refreshments, Judy! Stone bridges always appear to carry a lot of history with them. The beer looks good! One way the country has changed for the better – there is a lot more tasty beer. Those Scots learned to build from the Romans. Fierce invaders, but accomplished road engineers too. Look up the book “The Wall” by Alister Moffat. It is a wonderful exploration of Hadrian’s Wall and all the logistic of stone building. Fascinating. Surely a good read with a good craft brew in hand. The bridge is gorgeous! Those masons sure knew how to build em to last back in the day didn’t they! I like beer best of all on a really hot day, and the beer is icy cold in a frosted mug, or beer glass best. Can’t believe how hot it has been this year up north. I remember when we first moved from Florida up to New Hampshire and the weatherman talked about a day being hot, hazy and humid day. My husband and I laughed and said he didn’t really know what humidity really was unless he had lived in Texas or Florida. 🙂 I can also remember summers in New Hampshire when there was not one single heatwave with three consecutive days of 90 degrees or above. September is just around the corner and you should start having delightful weather. I would never have thought that either, Judy. I often wonder about our apple orchard and my picket fenced garden with climbing roses all around it. I have no ideal if the new owners have kept it up…weather can be a real challenge. Greetings from Franklin, NH! I’m so happy I discovered your wonderful blog Judy! I love everything I’ve seen so far. I MUST visit the Double Arch Stone Bridge! How lovely!! Hello from Strafford County to you in Merrimack County. 🙂 The bridge is a lovely part of our NH history. The cardinal flowers are lovely! Were they growing near the bridge? There is a small parking area. Once you park, you can walk onto the top of the bridge. So, when you get up there, look to the left and hopefully they will still be blooming because the larger clump was right in the middle and a smaller clump was off to the left.